From top to bottom, left to right, are (top) Charles Thiel, Nick Crumley, Kristin Mays, Steve Wilhelm, (bottom) Ashlyn Dunn, Mallory Zachrich and Ally Pierce. 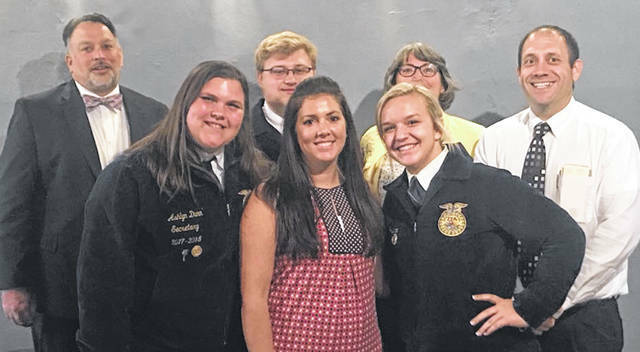 On Oct. 9, the Champaign County FFA held a countywide school administrator dinner at The Hive in Mechanicsburg. The evening began with a designated student from each school in the county introducing their staff attending the dinner. Urbana FFA President, Ashlyn Dunn introduced Urbana’s Agricultural Educators, Mallory Zachrich, Steve Wilhelm and Administrators Mrs. Kristin Mays and Mr. Charles Thiel. Ally Pierce, Urbana FFA Secretary, introduced the guest speaker Mr. Trey Colley, Precision Ag program manager at The Ohio State University. Mr. Colley shared information on new jobs in the agricultural industry. Urbana would like to thank all of the schools and administrators who attended. Your support of Agricultural Education is an important key to program success.